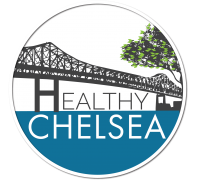 Healthy Chelsea, a citywide coalition, was launched in 2010 as the result of a comprehensive Community Health Needs Assessment (CHNA) done by the Massachusetts General Hospital’s (MGH) Center for Community Health Improvement (CCHI) in partnership with Chelsea city officials. At the time, obesity was identified as the city’s top health concern. Programs focusing on healthy eating and active living were developed, and early successes included a citywide ban of trans fat, the elimination of juice in all Chelsea public schools and improvement in the design and safety of local parks. In 2012, the Healthy Chelsea Coalition voted to expand its focus as residents and community partners identified substance use and its effects, including perceptions of violence and public safety, as the city’s top health concern. Community members emphasized the need for education and prevention strategies geared toward youth and families to improve overall health and safety. Healthy Chelsea is a true citywide collaboration with substantial support from the city’s leadership. The City Manager, the Director of Health and Human Services, the Director of Planning and Development, the Chief of Police and the Superintendent of the Chelsea Public Schools are all very active partners and community members. Strong collaboration among multi-sector organizations across the city further strengthens the coalition’s work. Chelsea is a densely populated community located two miles north of Boston and has long been a gateway city for immigrants from Central America and refugees fleeing countries devastated by war and poverty including Bosnia, Somalia, Iraq, Afghanistan, and Northern and Western Africa. Today, nearly half of Chelsea residents are foreign born, and over 68% speak a language other than English at home. Over 62% of residents (up from 28% in 2000) and 85% of public school students are Latino, and 30% of Chelsea public school students are new immigrants from 24 countries. Chelsea is one of the poorest communities in Massachusetts, and our young people are at risk. 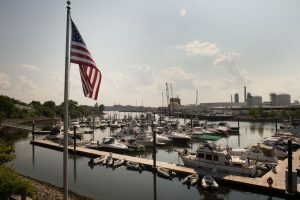 Over 24% of the population lives below the Federal Poverty Level, more than twice the 10.5% rate statewide, and Chelsea's per capita income of $20,617 ranks it 347th for income of all 351 cities and towns in the state. Fifty percent of Chelsea's public school students are from low-income families, almost twice the state rate of 27%, and Chelsea High's graduation rate in 2017 was just 60%, well below the state rate of 87.3%. Chelsea has survived many setbacks, but challenges to public health remain. In a 2015 community assessment involving multiple sectors including youth, focus group participants described Chelsea as having enormous challenges that threaten public health, safety, cohesion and progress. 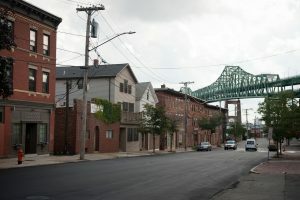 Residents expressed alarm about the interrelated problems of substance use, violence, gangs, theft and prostitution that leave people feeling unsafe, on edge and indoors. Not surprisingly, participants in the assessment identified substance misuse as Chelsea's top public health problem. Chelsea is a community with big city issues but small community dollars. It is a community that craves far more prevention efforts to break the cycle of response to immediate crises. Chelsea’s diversity is its strength. Almost 65% of the population is Latino, and 44% is foreign born, the largest foreign born population in Massachusetts. Residents and community partners have demonstrated the ability to come together around community projects and a shared vision of health. In fact, Chelsea was chosen from more than 200 applicant communities across the United States to win the prestigious 2017 Robert Wood Johnson Foundation’s (RWJF) Culture of Health Prize. The city was recognized for its resilience and collaborative spirit, its ability to provide services to its most vulnerable, and ensuring that Chelsea is a welcoming community for all. 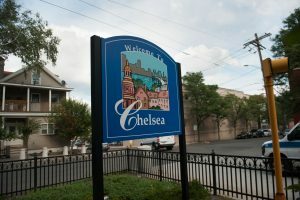 The RWJF acknowledged Chelsea’s work tackling public health issues such as substance use and trauma, and engaging and empowering the city’s youth in environmental and food justice projects. Healthy Chelsea is supported by the Massachusetts General Hospital (MGH) Center for Community Health Improvement (CCHI). CCHI hires and trains staff to provide leadership and support to community coalitions. These staff members report to CCHI but are accountable to the community. They mobilize community residents and leaders to assess health needs and create a plan to address them. CCHI acts as a community convener and facilitator, implementing best practices, providing evaluation support, and accessing a range of resources in the community.